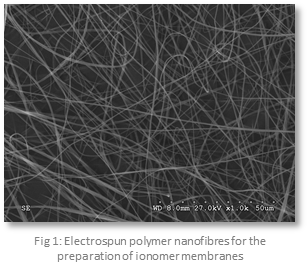 Electrospinning is a process leading to the formation of ultra-fine fibres with controlled and uniform diameters in the micrometre to nanometre range (see Figure 1), starting from fluid polymers (molten or in solution). Electrospinning has the advantages of simplicity, efficiency, low cost, high yield and high degree of reproducibility of the obtained materials. Furthermore, its versatility allows the production of organic, hybrid and inorganic nanofibres, as well as the elaboration of designed geometries (core-sheath, hollow fibres), assemblies and architectures (aligned or nonwoven fibres, cross-bars). This great variety of electrospun nanofibres in term of materials, structures, architectures and functionalities explains the increased use of the electrospinning technique and its extensive applications range.